Certa doesn’t always give beginners the help they need, but there's still plenty of power here for a great value price. 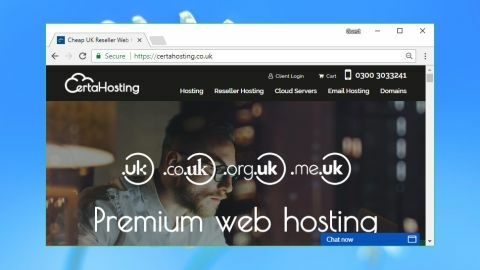 Certa is an experienced UK-based hosting company which offers 'premium website hosting' and 24/7 support for a budget price. The baseline specification is solid, with unlimited disk space and bandwidth, daily backups, easy installation of WordPress and other common apps, and comprehensive website management via the industry-standard cPanel. The £2.49 ($3.10) a month (excluding tax) Certa Lite account has some notable limits: it supports only one website, 10 email accounts and two MySQL databases. But there's more than enough power for many smaller projects, and it could be a sensible solution for some. Upgrading to the £3.99 ($5) a month Certa Pro plan gets you support for 10 websites, 50 MySQL databases and either 50 or 100 email accounts (the website lists both, confusingly). It also adds unlimited shared SSLs, a free website builder, subdomain and add-on domain support, plus it gives you a free domain when you sign up, and improves performance by allocating your account more RAM and processes. The £8.99 ($11.25) a month Certa Unlimited plan lives up to its name with support for unlimited websites, email accounts and MySQL databases. There's also a boost in resources, with the plan doubling your allocated RAM and entry processes. That might sound appealing, but if you want to run 'unlimited' websites from the account (or more than 10, anyway) you'll probably find performance will be poor. Demanding users might prefer one of Certa's virtual private server accounts. These start at £9.32 ($11.65) a month for a single-core, along with 1GB of RAM and 20GB of hard drive space, and offer a host of extensions and tweaks. You can add cores, RAM, SSD space and IPs, choose from many operating systems (Windows and Linux), add a control panel, backups, a hardware firewall and more. Every plan, even the humble Certa Lite, is protected by a surprisingly detailed service level agreement. Shared hosting network uptime should be 99.9%, you'll get a first acknowledgement to a support ticket within one hour, and ticket updates will take no longer than six hours, with escalation to senior staff happening in only 90 minutes. We don't know how often these targets will be achieved or precisely what they mean – might a first acknowledgement to a ticket include an answer, or is it only ever 'message received'? – but it's still good to see a hosting company spell out what you can expect. If it all goes horribly wrong, Certa doesn't deliver, or you just decide you don't need the account after all, a 30-day money-back guarantee ensures you'll get a refund of the hosting costs (as usual, domain registrations and other upfront costs aren't included). There are no restrictions and you don't have to contact support to justify the request – you can cancel from within your control panel. The Certa website makes it easy to explore the individual features of each plan. You can view the core basics or drill down to a more detailed comparison table which clearly highlights the differences between plans. Pricing is refreshingly honest. Opt to buy the £2.49 ($3.10) a month Certa Lite plan and you're not told that this price only applies if you buy two or three years upfront, like some of the sneakier competition. You don't even have to pay annually unless you want to do so; the plan really is available for £2.49 ($3.10) a month. There are a small number of add-ons, including 'advanced spam filtering' for £2 ($2.65) a month per domain, a dedicated IP address for £2.49 ($3.10) a month, and an 'LVE Boost' which doubles your resources for £5 ($6.60) a month. Certa's signup process works much the same as any other hosting company, with options to register a new domain or specify one you own already, then you enter your name and billing address, and choose a payment method (card or PayPal). We noticed a tiny issue in the terms and conditions page – it gives you a half-price promo code which turns out to be expired – but otherwise there were no problems. We handed over our cash, Certa redirected us to its web dashboard, a flurry of emails arrived (five? really? ), and after verifying our email address we were ready to begin. The Certa Hosting web dashboard is crammed with features: menus, buttons, panels, an expanding sidebar and more. While this can seem intimidating at first, it does make it easier to locate particular areas of the service, as just about everything is no more than a couple of clicks away. In this case, clicking My Services and choosing our hosting plan took us to a more focused control panel. This included shortcuts to key cPanel functions – Email Accounts, File Manager, Backup and more – as well as details on our package, cPanel username and password, Certa's name servers and more. Experts can launch cPanel with a click and go to work immediately, setting up and managing their site with all the usual tools and applets. Beginners are more likely to be left confused. It's likely that many customers will buy an account to host a WordPress site, for instance, but there's no indication of how you might set this up: no WordPress icon, no Install App button or anything else. Would the Knowledgebase offer some clues, we wondered? There is a tutorial entitled 'How to install WordPress', but this tells you to go to WordPress.org and download and install the package manually. Certa already provides the Softaculous platform which can install WordPress and many other apps all on its own, but the Knowledgebase doesn't even mention that. Newcomers to hosting may figure out the setup process themselves, as it's not too difficult (hit the cPanel button, scroll down to the Softaculous panel, click WordPress). Life might be easier if Certa highlighted this upfront, though, rather than pointing users to an entirely unnecessary manual setup procedure. If you prefer the graphical approach, customers on the Certa Pro and higher plans can alternatively use Certa's Zyro-based site builder. It doesn't have many templates, but the designs look good and the package is easy to use. If you're interested, check out the interface demo at the Zyro site. It's difficult to clearly assess the long-term performance of a web host from a single review, but digging into its various features can give indicators about the company and the level of service you'll get. Certa scored reasonably well for its server setup, with up-to-date versions of cPanel and Apache, and recent releases of PHP and MySQL. This should ensure you'll be able to run the latest editions of whatever web applications you need. The integration of cPanel with the rest of Certa's systems was more dubious. We clicked 'Open Ticket', and it displayed the My Details page; clicking Check Network Status displayed the Knowledgebase, and so on. Bizarrely, this wasn't consistent, and if we tested repeatedly we were sometimes taken to the right pages. Don't ask us why – we don't have the faintest idea. Heading off to the Knowledgebase revealed around 380 tutorials organized into various topics. While that sounds impressive, most of these weren't focused on hosting issues. Around 150 tutorials involved setting up email clients, for instance, and many of those were relatively obscure or out of date (DreamMail, SquirrelMail, Outlook 2010). Knowledgebase searches were rarely helpful. Entering 'install WordPress' returned a manual installation guide rather than pointing us to the automated process, as we mentioned earlier. Searching for 'permissions' gave us only a setup guide for Plesk, with nothing on cPanel or general concepts and troubleshooting, and a 'PHP version' search pointed us to an irrelevant 'How to install WHMCS' article. There's no real intelligence to the search process, either. Enter something like 'migrate WordPress' in some knowledgebases and even if there isn't a direct match, the system might give you related WordPress articles. Certa simply told us "no articles found." Would the support team be any better? We opened a live chat session and asked a simple product question. The agent asked us to wait, returned a couple of minutes later and suggested we send our question in an email. We did, but never received a reply. Live chat agents aren't usually the most experienced support staff, so we followed up by sending the same question via a support ticket. This time the results were much, much better, with a helpful and accurate reply arriving only 36 minutes after our query. As ever, we completed our tests by benchmarking our server with Bitcatcha, WebPagetest and a few other sites. Shared hosting performance can vary greatly over time, but our results were impressive for a budget service, with the site loading quickly for UK, European and North American connections. The Certa Hosting website could be easier to use, particularly for beginners, and the support site needs a major update. But the service also offers plenty of features and decent performance for very little cash, and it's well worth a look for more experienced users.